Moments after Kirani James crossed the line of the 400m semi-finals, he immediately went up to Oscar Pistorius to congratulate him. 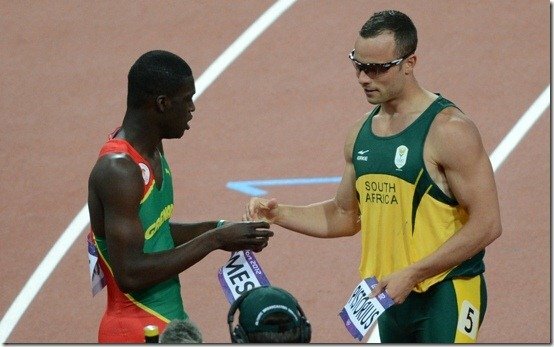 It was at that moment when Kirani James asked Oscar Pistorius to trade name bibs with him, not the other way around. Pistorius obliged, and then they shook hands and embraced a “man hug”. As much as the Olympics are made of medal counts by country, many viewers (and photographers!) look at these small moments as the ones that truly showcase what these competitions are all about. Just like the 100 meter Preliminary rounds… it’s a showcase of athletes around the world, and not the rigorous IAAF A standard. While Oscar Pistorius will be participating in the upcoming Paralympics, he also already has his sights set on the 2016 Olympics in Rio. I disagree with this. Oscar Pistorius should choose one Olympic Games. Either the able-bodied Olympics now, OR the Paralympics in a few weeks. Not both. I just don’t think it’s fair that he has the luxury of competing in both Games. But whatever Olympics he chooses, I support him 100%. 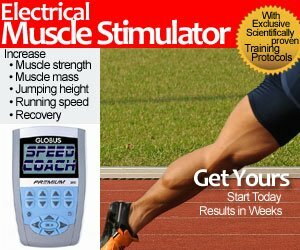 READ Alan Oliveira WR 20.66 - Should he Run in Able-Bodied Olympics? There have been others too. USSR based Ukranian 400m Hurdler Vyatsheslav Skomorohov. I agree with you…But this guy moved me less than Kirani’s spirit… Probably the next world record holder at 400m.. A nice kid, is not yet even an accomplished individual (and neither athlete)… he is just a kid. I love this boy and if everything will be fine, we have here the birth of a new “idol” of track and field….Not yet…he is just shaping right now. Guys like him in the history of sports made me choosing my path. We call them “inspirational” (role models would be just a pleonasm)… A real one…not fabricated ones as Carl Lewis.